Opera Rara releases Bellini’s first opera Adelson e Salvini, written in 1825 while the composer was still a student at the Naples Conservatory. 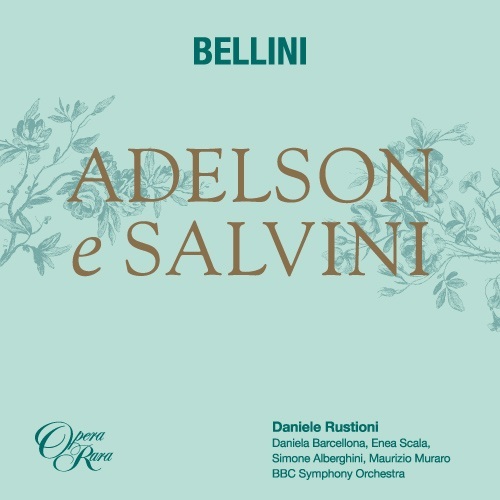 Inspired by Baculard d’Arnaud’s 1772 series of novellas, Les Épreuves du sentiment, Adelson e Salvini was so popular that the students of the Naples Conservatory performed it every Sunday for a year and its impact was such that the intendant of the Teatro di San Carlo immediately commissioned Bellini’s first professional opera. The opera is set in Ireland at some point in the seventeenth century, at a castle belonging to Lord Adelson. The beautiful grounds of the castle estate, with two small temples visible, each bearing a motto: on the left, ‘To Love’, and on the right, ‘To Sorrow’. Fanny, a young servant in Adelson’s household, is sitting on the grass sketching an image of her painting teacher Salvini, an Italian artist befriended by Adelson in Rome and brought back with him to Ireland. 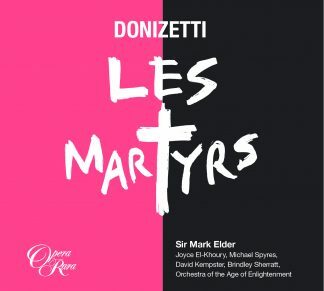 She sings of her secret love for Salvini (Introduction, ‘Immagine gradita’), but is interrupted by the arrival of her aunt, the housekeeper Madam Rivers, and other servants, including the duplicitous Geronio, to celebrate the imminent return of Adelson from London. Geronio claims that Adelson’s uncle is trying to keep Adelson there, but Madam Rivers assures them that all he wants is to return to his beloved fiancee Nelly. On their departure, Colonel Struley emerges, dressed in hunting clothes. Exiled from Ireland for an unspecified prior crime, Struley has returned to kidnap Nelly, his niece, and to take her back to London, with the help of an apprehensive Geronio (Aria, ‘Tu provi un palpito per la dimora’). Struley dismisses Geronio’s qualms about his plans, and they go their separate ways. Salvini’s Neapolitan servant Bonifacio then appears, and is met by a messenger with a letter listing his multiple creditors (Cavatina, ‘Bonifacio Voccafrolla?’) He vows to appeal to Salvini’s goodwill to pay them off, or else to run away to Siberia. Salvini enters, preoccupied by his own unrevealed passion for Nelly (Duet, ‘Speranza seduttrice’). He laments that Adelson ever persuaded him to leave Italy, and reveals that for ten days he has held onto a love letter for Nelly from Adelson. Salvini departs as Fanny, Nelly and Madam Rivers arrive; Nelly recalls her previous attempt at marriage to Adelson three years before, in the same castle, which was thwarted by the arrival of Struley’s henchmen to kidnap her. Fearing that Adelson will not return, she sings of her fading hopes for happiness (Romance, ‘Dopo l’oscuro nembo’). Salvini finally gives Nelly Adelson’s letter, and she asks him to read it to her; it confirms that Adelson’s uncle wishes him to stay in London and to marry someone else, in order to receive his inheritance. Nelly faints (Finale, ‘Ah! L’oppresse il dolor’), and comes round to find Salvini embracing her. To her horror, he confesses his love for her, before Bonifacio enters to announce the return of Adelson, who has escaped London to return to Nelly. Salvini departs confused and distraught, while Madam Rivers, Fanny, Bonifacio and a chorus of servants sing of their delight at their lord’s return. Adelson reaffirms his love for Nelly, and asks only for Salvini to make his happiness complete. The setting remains the same, but the motto ‘To Sorrow’ on one of the temples is replaced with ‘To Hymen’, while a garland of flowers hung between two trees carries the message ‘They are Reunited Forever’, with Adelson and Nelly’s initials above it. Geronio informs Struley of Adelson’s return and of his imminent marriage to Nelly, due to take place the next day. Struley is delighted that his planned revenge can begin so soon (Duet, ‘Eh, Geronio!’), and gloats over the upcoming separation of the betrothed couple. Geronio tells Struley that he found Salvini in a distant corner of the park, where he was bewailing his love for Nelly; Struley sees an opportunity to use Salvini to help realise his plans. Bonifacio tells Madam Rivers of Adelson’s despair at Salvini’s continued absence, but then misdirects both her and Fanny in their search for the painter, to avoid their discovery of his unbalanced state of mind. Adelson enters with Nelly, and vows to continue looking for his friend. On his departure, Bonifacio tells Nelly that he knows of Salvini’s love for her, and that they must avoid a confrontation between him and Adelson. Adelson discovers Salvini about to kill himself, ridden with guilt for his impossible love. Adelson unknowingly appeals to their friendship, while Salvini remains horrified by the prospect of attending the upcoming marriage. (Duet, ‘Torna, o caro’). On Adelson’s departure, Struley promises Nelly to Salvini, claiming that Adelson has already married in London, and offering a faked letter as proof. In reading the letter, Salvini realises that he is talking to Nelly’s former abductor, but Struley persuades him that it is Adelson who is guilty of treachery, and that Salvini should therefore show Nelly the letter, and abduct her himself. Once Salvini has gone, Bonifacio spots Struley, and observes him suspiciously, thinking that he might be a debt collector. Struley assures him that he is a simple hunter, and escapes, only for Bonifacio to find Salvini, who insists unexpectedly that Adelson will soon bring him happiness; Bonifacio is left to puzzle things out alone (Aria, ‘Ora vi’, lo caso è bello!’). With everyone present, Adelson offers Fanny’s hand to Salvini (Finale, ‘Ecco alfin quel caro oggetto’). Fanny is delighted, but the bewilderment of Nelly and Salvini at this turn of events is interrupted by the announcement of a fire in the estate farmhouse that threatens the castle. Adelson entrusts Nelly to Salvini, who instantly tries to persuade her that she has been betrayed by Adelson; Nelly refuses to believe it, and is shocked to see Struley arrive. Nelly convinces Salvini of Struley’s evil designs, and Struley and Geronio threaten them both. Nelly faints in horror, and Struley carries her off; Salvini gives chase, and a gunshot is heard offstage. The others return to announce that the fire has been put out, but this good news is overshadowed by Salvini’s reappearance, believing that he has killed Nelly. The act opens inside a pavilion, lit by a single flickering lamp. Adelson sits deep in thought, contemplating revenge on Salvini, and then sends for Bonifacio. Adelson promises to pardon him for his part in Salvini’s actions, if he reveals the truth about whether Nelly was having an affair with Salvini. Bonifacio claims they were, but that Adelson himself was to blame for leaving the two of them along together so much (Duet, ‘Miette l’esca vicin’a lo ffuoco’). Adelson is stricken by his own complicity, and frees Bonifacio. He then brings in Salvini, who confesses his love for Nelly, and explains that it was Struley who had fired the shot, and that he had intended to kill Struley, only to kill Nelly by mistake with a knifeblow. Adelson announces that he will show Salvini the murdered Nelly by way of revenge; Salvini begs to be killed instead (Aria with chorus, ‘Si cadrò… ma estinto ancora’), only for Adelson to open the curtains to show Nelly alive, together with Fanny, Madame Rivers and a group of peasants crowning her with flowers. Nelly reveals that the blow from Salvini had caught in her cloak. In the aftermath, Adelson’s servants had captured Struley and Geronio in a nearby cave and taken them to prison. Adelson forgives the repentant Salvini, and to show his clemency sends him back to Italy with a generous allowance. Finally, Adelson and Nelly are able to marry (Chorus, ‘Ah Nelly, tributo umìle’). Ort der Handlung ist ein Schloss im Besitz Lord Adelsons in Irland im 17. Jahrhundert. Die wunderschönen Schlossanlagen mit zwei kleinen Tempeln, die jeweils ein Motto tragen: links „Der Liebe gewidmet“, rechts „Dem Schmerz gewidmet“. Fanny, eine junge Bedienstete im Haushalt Adelsons, sitzt im Gras und porträtiert ihren Mallehrer Salvini, einen italienischen Künstler, mit dem Adelson aus Rom nach Irland zurückkehrte. Fanny singt von ihrer heimlichen Liebe zu Salvini (Einleitung: „Immagine gradita“), wird aber durch die Ankunft ihrer Tante, der Wirtschafterin Madame Rivers, und anderer Dienstboten unterbrochen, die eine festliche Begrüßung für den aus London heimkehrenden Adelson planen. Unter ihnen befindet sich auch der doppelzüngige Geronio, der behauptet, Adelsons Onkel versuche, ihn bei sich in London zu behalten, Madame Rivers aber beteuert, ihr junger Herr wünsche sich nichts sehnlicher, als zu seiner geliebten Verlobten Nelly zurückzukehren. Als sie aufbrechen, erscheint Colonel Struley in Jagdkleidung. Er wurde wegen eines nicht näher genannten früheren Verbrechens aus Irland verbannt, ist nun aber zurückgekommen, um seine Nichte Nelly mit der Hilfe Geronios nach London zu entführen. Struley tut die Bedenken des ängstlichen Geronios ab (Arie: „Tu provi un palpito per la dimora“), und sie gehen getrennter Wege. Salvinis neapolitanischer Diener Bonifacio erscheint und erhält von einem Boten einen Brief, in dem seine zahlreichen Gläubiger aufgelistet werden (Cavatine: „Bonifacio Voccafrolla?“). Er gelobt, an Salvinis Wohlwollen zu appellieren und die Schulden zu begleichen, sonst werde er davonlaufen und nach Sibirien fliehen. Salvini tritt auf und sinniert über seine heimliche Leidenschaft für Nelly (Duett: „Speranza seduttrice“). Er beklagt den Tag, an dem Adelson ihn überredete, Italien zu verlassen, und gesteht, dass er seit zehn Tagen einen Liebesbrief Adelsons an Nelly zurückhält. Er tritt ab in dem Moment, als Fanny, Nelly und Madame Rivers erscheinen. Nelly erinnert sich an den ersten Versuch einer Hochzeit mit Adelson vor drei Jahren, die durch die Ankunft von Struleys Gefolgsleuten vereitelt wurde, die Nelly aus eben diesem Schloss entführten. Sie fürchtet, Adelson werde nicht zurückkommen, und singt von ihrer schwindenden Hoffnung auf Glück (Romanze: „Dopo l’oscuro nembo“). Nun schließlich händigt Salvini ihr Adelsons Brief aus. Auf ihren Wunsch hin liest er ihn vor, und sie erfährt, dass sich Adelsons Onkel in der Tat wünscht, sein Neffe möge in London bleiben und eine andere Frau ehelichen, um sein Erbe anzutreten. Nelly fällt in Ohnmacht (Finale: „Ah! L’oppresse il dolor“), und als sie wieder zu sich kommt, findet sie sich in Salvinis Armen wieder. Zu ihrem Entsetzen gesteht er ihr seine Liebe, dann jedoch kommt Bonifacio hinzu und verkündet Adelsons Ankunft; dieser sei aus London geflohen, um zu Nelly zurückzukehren. Verwirrt und unglücklich tritt Salvini ab, während Madame Rivers, Fanny, Bonifacio und ein Chor von Bediensteten ihrer Freude über die Rückkehr ihres Herrn Ausdruck verleihen. Adelson spricht von seiner Liebe zu Nelly und erklärt, nur die Anwesenheit seines Freundes Salvini fehle noch zu seinem Glück. Die Kulisse hat sich nicht verändert, aber das Motto „Dem Schmerz gewidmet“ ist durch „Hymen gewidmet“ ersetzt. Zwischen zwei Bäumen hängt eine Blumengirlande mit dem Schriftzug „Für immer vereint“, darüber die Initiale von Adelson und Nelly. Geronio berichtet Struley von Adelsons Rückkehr und dessen Hochzeit mit Nelly, die für den folgenden Tag angesetzt ist. Zufrieden hört Struley, dass der Zeitpunkt seiner Rache bevorsteht (Duett: „Eh, Geronio!“), und weidet sich an der baldigen Trennung des Paares. Geronio teilt Struley zudem mit, dass er Salvini in einer abgelegenen Ecke des Parks gesehen habe, wo dieser seine Liebe zu Nelly besungen habe. Struley wittert eine Chance, Salvini für die Umsetzung seiner Pläne einzuspannen. Bonifacio erzählt Madame Rivers von Adelsons Kummer über Salvinis Ausbleiben, weist sie und Fanny bei ihrer Suche nach dem Maler aber bewusst in die falsche Richtung, damit sie diesen nicht in seiner unglücklichen Gemütsverfassung antreffen. Adelson tritt zusammen mit Nelly auf und gelobt, weiter nach dem Freund zu suchen. Kaum ist er fort, gesteht Bonifacio gegenüber Nelly, dass er von Salvinis Liebe zu ihr weiß und sie beide um jeden Preis eine Auseinandersetzung zwischen ihm und Adelson verhindern müssen. Von Schuldgefühlen wegen seiner verbotenen Liebe überwältigt, will Salvini sich das Leben nehmen, doch in dem Moment stößt Adelson auf ihn. In seiner Ahnungslosigkeit beschwört er ihn im Namen ihrer Freundschaft, während Salvini die Aussicht, an der bevorstehenden Hochzeit teilnehmen zu müssen, nach wie vor entsetzt (Duett: „Torna, o caro“). Als Adelson abtritt, verspricht Struley Salvini die Hand Nellys und behauptet, Adelson habe bereits in London geheiratet. Zum Beweis reicht er Salvini einen gefälschten Brief, bei dessen Lektüre dem Maler klar wird, dass er mit Nellys einstigem Entführer spricht. Struley jedoch überzeugt ihn, dass in Wirklichkeit Adelson der Verräter sei und Struley deshalb Nelly den Brief zeigen und sie selbst entführen müsse. Kaum ist Salvini fort, stößt Bonifacio auf Struley und beobachtet ihn misstrauisch aus Angst, er könne ein Schuldeneintreiber sein. Struley jedoch beteuert, er sei lediglich ein Jäger, und entkommt. Dann trifft Bonifacio auf Salvini, der unerwarteterweise nun erklärt, Adelson werde ihm bald Glück bringen. Bonifacio bleibt allein zurück, um diesen erstaunlichen Gesinnungswandel zu überdenken (Arie: „Ora vi’, lo caso è bello!“). Als alle wieder versammelt sind, bietet Adelson seinem Freund Salvini Fannys Hand an (Finale: „Ecco alfin quel caro oggetto“). Fanny ist überglücklich, Nelly und Salvini jedoch sind konsterniert ob dieser Wendung. Dann allerdings wird gemeldet, dass ein Feuer im Gutshaus das Schloss bedrohe. Adelson lässt Nelly in Salvinis Obhut zurück, und dieser versucht sofort, sie zu überzeugen, dass Adelson sie hintergangen habe, was Nelly allerdings weit von sich weist. Entsetzt sieht sie dann Struley hinzukommen. Es gelingt ihr, Salvini von den schlechten Absichten ihres Onkels zu überzeugen, woraufhin Struley und Geronio sie beide bedrohen. Nelly fällt vor Angst in Ohnmacht, und Struley schleppt sie fort, Salvini nimmt die Verfolgung auf, und hinter der Bühne ist ein Schuss zu hören. Die anderen kehren zurück mit der Nachricht, dass der Brand gelöscht wurde, doch wird diese frohe Botschaft durch Salvinis Erscheinen überschattet, der glaubt, er habe Nelly getötet. Ein Pavillon, der von einer einzelnen flackernden Lampe erleuchtet ist. Gedankenverloren sinniert Adelson, ob er sich an Salvini rächen solle, lässt dann aber nach Bonifacio schicken und verspricht, ihm seine Beteiligung an Salvinis Vorgehen zu verzeihen, wenn er ihm wahrheitsgetreu sage, ob Nelly mit Salvini eine Affäre gehabt habe. Bonifacio behauptet, die habe es gegeben, doch sei Adelson selbst schuld daran, denn er habe die beiden allzu lange zu zweit allein gelassen (Duett: „Miette l’esca vicin’a lo ffuoco“). Bestürzt über seine eigene Mitschuld, gewährt Adelson Bonifacio die Freiheit. Dann lässt er Salvini kommen, der seine Liebe zu Nelly gesteht und beteuert, es sei Struley gewesen, der den Schuss abgefeuert habe; er seinerseits habe geplant, Struley umzubringen, habe aus Versehen jedoch Nelly mit einem Messerstich getötet. Zur Rache, so sagt Adelson, werde er Salvini die ermordete Nelly zeigen, woraufhin Salvini ihn anfleht, ihn stattdessen zu töten (Arie mit Chor: „Si cadrò… ma estinto ancora“), woraufhin Adelson den Vorhang aufzieht und eine quicklebendige Nelly zum Vorschein kommt, umgeben von Fanny, Madame Rivers und einer Gruppe Bauern, die sie mit Blumen kränzen. Nelly erklärt, dass Salvinis Stich nur ihren Umhang getroffen habe; in der Folge hätten Adelsons Bedienstete Struley und Geronio in einer Höhle in der Umgebung festgesetzt. Adelson verzeiht dem reumütigen Salvini und schickt ihn zum Zeichen seiner Gnade mit einer großzügigen Abfindung nach Italien zurück. Und schließlich und endlich können Adelson und Nelly Hochzeit feiern (Chor: „Ah Nelly, tributo umìle“). L’opera è ambientata in Irlanda durante il XVII secolo, in un castello di proprietà di Lord Adelson. Nel delizioso parco del castello sono visibili due tempietti. Ciascuno reca un’iscrizione: quello a sinistra, “All’amore”, e quello a destra, “Al dispiacere”. Seduta sull’erba Fanny, giovane domestica di Adelson, disegna il ritratto del suo insegnante di pittura, Salvini, un artista italiano con cui Adelson ha fatto amicizia a Roma e da cui si è fatto accompagnare in Irlanda. Fanny è segretamente innamorata di lui (Introduzione, ‘Immagine gradita’). La sua meditazione viene interrotta dall’arrivo di sua zia, la governante Madama Rivers, con altri servitori, compreso lo sleale Geronio, per festeggiare l’imminente ritorno di Adelson da Londra. A detta di Geronio, Adelson è trattenuto a Londra da suo zio. Madama Rivers smentisce e assicura a tutti che l’unico desiderio del giovane è ritornare a fianco dell’amata fidanzata Nelly. Il gruppo si allontana ed entra il Colonnello Struley, in abbigliamento da cacciatore. Da tempo in esilio per motivi non spiegati, è ritornato in Irlanda per rapire Nelly, sua nipote, e riportarla a Londra; per questo conta sull’aiuto di Geronio, nonostante questi nutra degli scrupoli (Aria, ‘Tu provi un palpito per la dimora’). Dopo una discussione, i due si separano. A questo punto compare Bonifacio, servo napoletano di Salvini; un messaggero gli consegna una missiva che elenca i suoi numerosi creditori (Cavatina, ‘Bonifacio Voccafrolla?’). L’uomo si ripromette di chiedere aiuto al padrone per non essere costretto a fuggire in Siberia. Entra Salvini, tormentato dalla sua passione inconfessata per Nelly (Duetto, ‘Speranza seduttrice’). Rimpiange di essersi lasciato convincere a lasciare l’Italia e rivela che da dieci giorni è in possesso di una lettera d’amore di Adelson indirizzata a Nelly. Salvini si allontana mentre arrivano Fanny, Nelly e Madama Rivers; Nelly ricorda che già tre anni prima era pronta a celebrare le nozze con Adelson nel castello, ma era stata rapita dai sicari di Struley. Il timore che Adelson non faccia ritorno mina le sue speranze di felicità (Romanza, ‘Dopo l’oscuro nembo’). Salvini consegna finalmente a Nelly la lettera di Adelson e la donna gli chiede di leggerla; vi trova la conferma che lo zio di Adelson desidera trattenere a Londra il nipote e gli impone di sposare un’altra per avere diritto alla sua eredità. Nelly sviene (Finale, ‘Ah! L’oppresse il dolor’), e quando ritorna in sé si ritrova tra le braccia di Salvini che l’aveva sorretta e che, con suo grande orrore, confessa di amarla. Entra Bonifacio ad annunciare il ritorno di Adelson, fuggito da Londra per ritornare da Nelly. Salvini si allontana, in preda alla confusione e alla disperazione, mentre Madama Rivers, Fanny, Bonifacio e un coro di servitori si rallegrano per il ritorno del padrone. Adelson rinnova le sue dichiarazioni d’amore per Nelly, e poi chiede dell’amico Salvini: manca solo lui a coronare la sua felicità. La stessa ambientazione, ma il motto “Al dispiacere” su uno dei due tempietti è stato sostituito da “Ad Imene”, mentre una ghirlanda di fiori appesa tra due alberi reca l’iscrizione “Essi sono riuniti per sempre”, sormontata dalle iniziali di Adelson e Nelly. Geronio comunica a Struley che Adelson è tornato e sposerà Nelly il giorno successivo. Struley è lieto di poter affrettare la propria vendetta (Duetto, ‘Eh, Geronio!’), e pregusta la prossima separazione della coppia. Geronio racconta a Struley di aver visto Salvini in tormento a causa del suo amore per Nelly in un angolo remoto del parco e Struley pensa di poter sfruttare la situazione per realizzare il suo piano. Bonifacio rivela a Madama Rivers che Adelson è disperato per la prolungata assenza di Salvini e la spedisce a cercarlo con Fanny, ma indica la direzione sbagliata, per evitare che si accorgano del suo precario stato mentale. Entra Adelson con Nelly e promette di continuare a cercare l’amico. Quando si allontana, Bonifacio rivela a Nelly di essere a conoscenza della passione di Salvini per lei e la esorta a evitare un confronto tra i due amici. Adelson trova Salvini sul punto di suicidarsi, tormentato dal senso di colpa per il suo amore impossibile. Totalmente ignaro della situazione, Adelson fa appello alla loro amicizia, mentre Salvini rimane inorridito alla prospettiva di essere presente al matrimonio imminente. (Duetto, ‘Torna, o caro’). Quando Adelson si allontana, Struley promette Nelly a Salvini, mostrandogli una lettera falsa in cui si dice che Adelson si è già sposato a Londra. Leggendo, Salvini si rende conto che l’uomo è il rapitore di Nelly, ma Struley lo convince che il vero traditore è Adelson: Salvini deve mostrare la lettera a Nelly e poi rapirla. Quando Salvini si è allontanato, Bonifacio scorge Struley e l’osserva con sospetto: teme che possa essere un ufficiale giudiziario. Struley sostiene di essere un cacciatore e fugge, ma Bonifacio trova Salvini, il quale stranamente dichiara che Adelson gli porterà presto la felicità. Rimasto solo, Bonifacio riflette per cercare di interpretare la situazione (Aria, ‘Ora vi’, lo caso è bello!’). Alla presenza di tutti, Adelson offre la mano di Fanny a Salvini (Finale, ‘Ecco alfin quel caro oggetto’). Fanny è al colmo della felicità, mentre Nelly e Salvini rimangono stupefatti davanti a questo colpo di scena. Tutto viene interrotto dall’annuncio di un incendio nell’aia, che minaccia anche il palazzo. Adelson affida Nelly a Salvini, il quale prova subito a convincerla inutilmente che il fidanzato l’ha tradita. Arriva Struley e la donna, sconvolta, rivela la sua vera identità e le sue trame al pittore, mentre sopraggiunge Geronio. Nelly sviene, inorridita, e Struley la porta via di peso, inseguito da Salvini. Si sente un colpo di fucile fuori scena. Gli altri ritornano per annunciare che l’incendio è stato domato, ma il sollievo generale viene oscurato dal ritorno di Salvini, convinto di aver ucciso Nelly. L’atto si apre all’interno di un lugubre padiglione, illuminato dalla fioca luce di una lampada. Adelson è seduto qui, immerso nei suoi pensieri, e medita vendetta contro Salvini. Poi fa chiamare Bonifacio e gli promette il perdono a patto che riveli la verità sulla presunta relazione tra Salvini e Nelly. Bonifacio conferma i sentimenti del padrone, ma ne attribuisce la responsabilità ad Adelson per la sua lunga assenza (Duetto, ‘Miette l’esca vicin’a lo ffuoco’). Colpito dalla logica del ragionamento, Adelson lascia libero Bonifacio. Poi fa entrare Salvini, il quale confessa il proprio amore per Nelly. Racconta che Struley ha sparato un colpo di fucile e che, nel tentativo di fermarlo con un pugnale, è stato lui a colpire per errore Nelly, uccidendola. Adelson dichiara che per vendetta gli mostrerà il cadavere di Nelly; Salvini lo supplica di uccidere lui invece (Aria con coro, ‘Si cadrò… ma estinto ancora’), ma a questo punto Adelson solleva le tende e gli mostra che Nelly è viva, circondata da Fanny, Madama Rivers e un gruppo di contadini che l’incoronano di fiori. Nelly rivela che il pugnale di Salvini era scivolato sul suo mantello. Successivamente i servi di Adelson avevano inseguito Struley e Geronio che si erano rifugiati una grotta vicina e li avevano catturati. Adelson perdona Salvini, pentito, e per dimostrare la sua clemenza lo rimanda in Italia con un generoso assegno. Finalmente Adelson e Nelly possono convolare a nozze (Coro, ‘Ah Nelly, tributo umìle’). L’action se passe au XVIIe siècle, en Irlande, dans le château de Lord Adelson. Dans le magnifique parc du château, on aperçoit deux petits temples, chacun orné d’une inscription : « À l’Amour » à gauche et, à droite, « Au Chagrin ». Assise dans l’herbe, la jeune Fanny, pupille d’Adelson, esquisse le portrait de son professeur de peinture, Salvini, artiste italien avec lequel Adelson s’est lié d’amitié lors d’un séjour à Rome et qu’il a fait venir avec lui en Irlande. Fanny chante son amour secret pour Salvini (introduction : « Immagine gradita »). Elle est interrompue par l’arrivée de sa tante, Madame Rivers, la gouvernante, accompagnée d’autres serviteurs, dont le fourbe Geronio ; ils se préparent à accueillir Adelson, bientôt de retour de Londres. Geronio prétend que l’oncle d’Adelson cherche à le retenir à Londres, mais Madame Rivers affirme à tout le monde que son maître a pour seul souci de venir retrouver sa fiancée bien-aimée, Nelly. Ils s’éloignent et le colonel Struley apparaît en habit de chasse. Banni d’Irlande pour un crime inconnu, Struley est revenu pour enlever Nelly, sa nièce, et l’emmener de force à Londres grâce à l’aide de Geronio, qui toutefois hésite (aria : « Tu provi un palpito per la dimora »). Le colonel balaie ses scrupules avant qu’ils ne se séparent. Le valet napolitain de Salvini, Bonifacio, fait son entrée suivi d’un messager porteur d’une lettre qui recense ses multiples créanciers (cavatina : « Bonifacio Voccafrolla ? »). Bonifacio jure de faire appel à la générosité de son maître pour régler ses dettes, sinon il s’enfuira en Sibérie. Arrive Salvini qui est secrètement amoureux de Nelly (duo : « Speranza seduttrice »). Il regrette de s’être laissé persuader de quitter l’Italie et révèle que depuis dix jours il a en sa possession une lettre d’amour d’Adelson destinée à Nelly. Salvini s’éloigne à l’approche de Fanny, Nelly et Madame Rivers ; Nelly évoque ses préparatifs de mariage précédents avec Adelson, qui furent interrompus il y a trois ans, dans ce même château, par l’arrivée des hommes de Struley venus l’enlever. Craignant qu’Adelson ne revienne pas, elle doute de ses chances de bonheur (romance : « Dopo l’oscuro nembo »). Salvini se résout à remettre la lettre d’Adelson à Nelly, qui lui demande de la lui lire ; Adelson y explique que son oncle souhaite le voir rester à Londres pour faire un riche mariage. Nelly s’évanouit (finale : « Ah ! L’oppresse il dolor »). Lorsqu’elle reprend ses esprits, elle est dans les bras de Salvini qui, au plus grand désarroi de la jeune femme, lui déclare son amour. Bonifacio arrive sur ces entrefaites pour annoncer le retour d’Adelson, parvenu à fuir Londres pour rejoindre Nelly. Salvini, confus et désemparé, prend congé, tandis que Madame Rivers, Fanny, Bonifacio et le chœur des serviteurs se réjouissent du retour de leur maître. Celui-ci réaffirme son amour pour Nelly, en disant que seule la présence de Salvini manque à son bonheur. Même décor, à part que « À l’Hymen » a remplacé « Au Chagrin » au fronton d’un des temples, et qu’une guirlande de fleurs tendue entre deux arbres porte l’inscription « Réunis à jamais » surmontée des initiales d’Adelson et de Nelly. Geronio annonce au colonel Struley le retour d’Adelson et son mariage avec Nelly le lendemain. Heureux à l’idée de pouvoir mettre en œuvre sa vengeance aussi rapidement (duo : « Eh, Geronio ! ») Struley se réjouit à l’avance de la séparation prochaine des fiancés. Geronio lui dit qu’il a vu Salvini pleuranr sur son amour impossible pour Nelly dans un coin isolé du parc ; le colonel y voit la chance de se servir de ce dernier pour réaliser ses plans. Bonifacio confie à Madame Rivers qu’Adelson se désole de la disparition du peintre, mais l’envoie dans la mauvaise direction pour que, partie à sa recherche avec Fanny, elle ne découvre pas qu’il a perdu l’esprit. Adelson arrive accompagné de Nelly, et jure de continuer à chercher son ami. À son départ, Bonifacio révèle à Nelly qu’il a découvert les sentiments de Salvini pour elle et qu’il faut absolument éviter un affrontement entre le peintre et Adelson. Adelson découvre Salvini au moment où celui-ci s’apprête à se suicider, tant cet amour impossible lui cause de remords. Lorsqu’Adelson, plein de bonne foi, en appelle à leur amitié, Salvini est épouvanté à l’idée d’assister à ses noces (duo : « Torna, o caro »). Adelson parti, Struley vient promettre Nelly à Salvini : il lui assure qu’Adelson est déjà marié à Londres et lui en donne pour preuve une fausse lettre. À la lecture du document, Salvini se doute que son interlocuteur est l’auteur de l’enlèvement précédent de Nelly, mais Struley le convainc toutefois de la fourberie d’Adelson et le presse de montrer cette lettre à Nelly et d’enlever la jeune femme. Une fois Salvini parti, Bonifacio aperçoit Struley et l’aborde avec suspicion craignant qu’il ne représente ses créanciers. Le colonel lui assure qu’il n’est qu’un simple chasseur et s’éclipse. Peu après Bonifacio tombe sur Salvini qui, à sa surprise, lui explique qu’Adelson va bientôt faire son bonheur ; resté seul, Bonifacio cherche à comprendre (aria : « Ora vi’, lo caso è bello ! »). Devant tous, Adelson offre la main de Fanny à Salvini (finale : « Ecco alfin quel caro oggetto »). Fanny est ravie, tandis que Nelly et Salvini sont surpris par la tournure des événements. Mais déjà on annonce qu’un incendie vient d’éclater dans la ferme du domaine et menace de s’étendre au château. Adelson confie Nelly à Salvini, qui tente immédiatement de la convaincre de la trahison d’Adelson ; Nelly refuse de le croire et, choquée, voit arriver Struley. Nelly persuade Salvini des mauvais desseins du colonel. Struley et Geronio les menacent alors l’un et l’autre. Nelly s’évanouit d’épouvante et Struley s’empare d’elle ; Salvini se lance à leur poursuite et un coup de feu retentit dans les coulisses. On vient annoncer que l’incendie est éteint mais cette bonne nouvelle est assombrie par la réapparition du peintre, persuadé d’avoir tué Nelly. L’intérieur d’un pavillon faiblement éclairé d’une unique lampe. Plongé dans ses pensées, Adelson s’interroge sur la manière de se venger de Salvini, et envoie chercher Bonifacio. Adelson promet de pardonner au valet sa complicité avec son maître, à condition qu’il lui dise la vérité sur les relations entre celui-ci et Nelly. Bonifacio prétend qu’ils étaient amants, mais qu’Adelson est coupable de les avoir laissé passer autant de temps ensemble (duo : « Miette l’esca vicin’a lo ffuoco »). Frappé de sa propre complaisance, Adelson laisse partir Bonifacio. Il fait venir Salvini, qui lui avoue son amour pour Nelly et explique que c’est Struley qui a tiré mais qu’en croyant tuer celui-ci il a lui-même porté, par erreur, un coup mortel à Nelly. Adelson lui répond que par vengeance il va lui montrer le corps de la jeune femme assassinée, et Salvini l’implore plutôt de le tuer (aria avec chœur : « Si cadrò… ma estinto ancora »). Alors seulement Adelson écarte les rideaux qui cachaient une Nelly bien vivante, accompagnée de Fanny, de Madame Rivers et de paysans qui lui tressent une couronne de fleurs. Nelly révèle que, lorsque Salvini a frappé, sa lame s’est prise dans le tissu de son manteau. Peu après, les serviteurs d’Adelson ont rattrapé Struley et Geronio dans une grotte voisine et les ont faits prisonniers. Adelson pardonne Salvini, qui se repent, et dans un geste de clémence le renvoie en Italie avec une forte bourse. Adelson et Nelly peuvent enfin s’épouser (chœur : « Ah Nelly, tributo umìle »).